Explanation: Frederic Church (1826-1900), American landscape painter of the Hudson River School, painted what he saw in nature. And on July 20th, 1860, he saw a spectacular string of fireball meteors cross the Catskill evening sky, an extremely rare Earth-grazing meteor procession. From New York City, poet Walt Whitman (1819-1892) also wrote of the "... strange huge meteor procession, dazzling and clear, shooting over our heads" in his poem Year of Meteors (1859-60). But the inspiration for Whitman's words was forgotten. His astronomical reference became a mystery, the subject of scholarly debate until Texas State University physicists Donald Olson and Russell Doescher, English professor Marilynn Olson, and Honors Program student Ava Pope, located reports documenting the date and timing of the spectacular meteor procession. The breakthrough was spotting the connection with Church's relatively little-known painting. 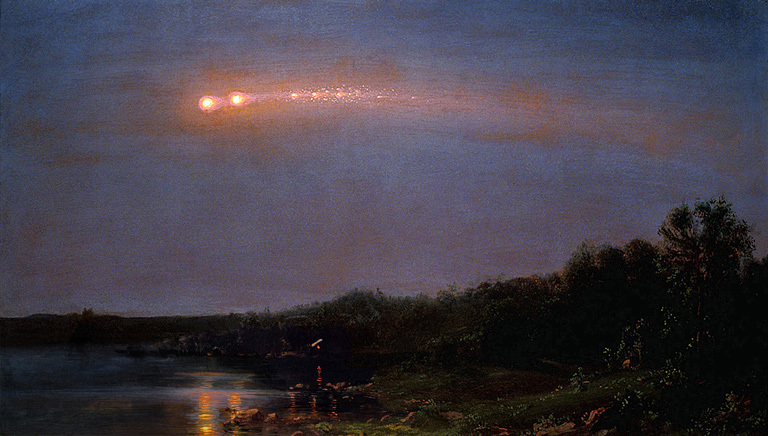 Fittingly, the forensic astronomy team's work was just published, on the 150th anniversary of the cosmic event that inspired both poet and painter.